TIJUANA – Five years ago, seemingly no one in this city of about 2 million people would have believed that a single man–a dreamer, some labeled him back then –would accomplish the unthinkable: to provide a city stuck with small, outdated libraries, with a large, modern library filled with computers and state-of-the art equipment and books, lots of books. Well, it happened. Tijuana now has a modern library, thanks to Father David Ungerleider Kepler. ‘el Padre David’ or Father David, as he is known by the students of lberoamericana University, the Jesuit college where he teaches, is at the end of an extraordinary mission. 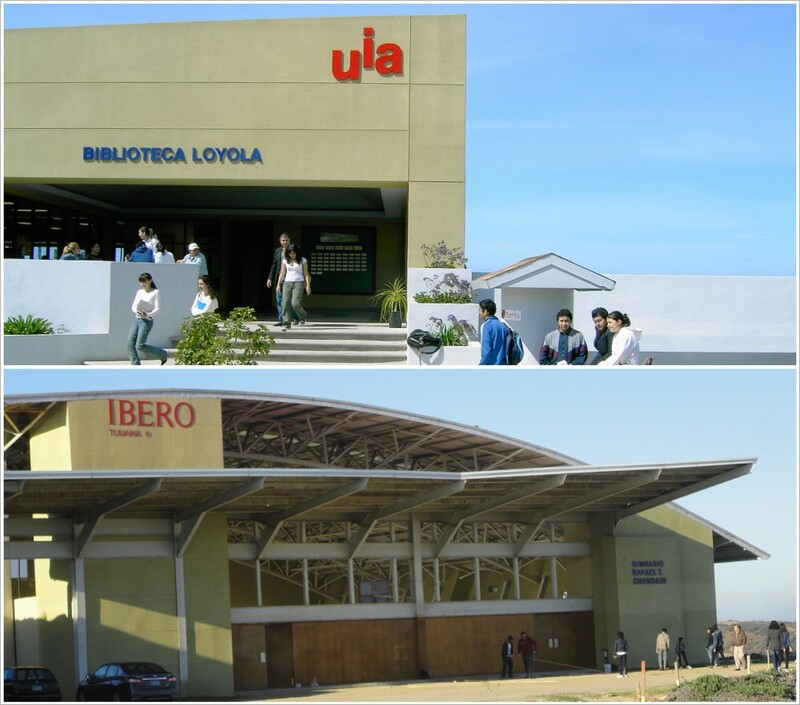 The library, which occupies two acres in the heart of the Iberoamericana University campus, was inaugurated on Dec 5,, 2003. However, even though it has computers and a great deal of books, it still needs more computers, more books, and air conditioning and heater units. To Ungerleider, this only means more of the same–work, work, work. But he is a confident man. Challenges only make the struggles interesting, not formidable obstacles. He is a True Believer, and it could be said that True Believers are in a very real sense, unstopable. To wit: Not only have Ungerleider’s efforts succeeded in completing the library – located in university grounds and named after lgnacio de Loyola, the Basque priest founder of the Jesuits- but he’s also involved in three other projects at the university, two of which at the moment are in several stages of construction: a retreat house, the only Catholic retreat in Baja and seemingly one of only two Catholic retreats in the region (Oceanside has one); a gymnasium and auditorium, and the Sacred Heart Chapel (modeled after the missions that the Jesuits built along the Baja peninsula three centuries ago). The extraordinary part of all this is that all four are projects of Ungerleider’s fertile brain, part of his quest to bring knowledge, physical-well being and spirituality to Tijuanans, who “deserve this and so much more,” a phrase he repeats often like a mantra. “Fund raising is not easy (but) David is a follow through person (who) puts his whole being into all that he does–giving homilies, building churches, libraries, gymnasiums, retreat houses, exercising, interacting with family (he is one of 12 children). Ungerleider, who is in his fifties, is a slight, fair-haired American whose past confirms what Dolan says about him– a man who believes in humanity and the power of one to move mountains. In the City of Brotherly Love — Philadelphia –there’s this message on a plaque dedicated by Centro Pedro Claver, a community center, to its founder, Ungerleider: If Our House is Still Standing, Its Foundation Must be Strong. It’s been more than 25 years since Ungerleider took the city of Philadelphia on behalf of that city’s dispossessed, occupying boarded up houses and turning them into family havens. There were 85 families asking for a chance to get a home and the city was dragging its feet, said Ungerleider during a 2000 interview. So, he explained, he and the families went to Independence Hall and began a long sit-in. We weren’t going to leave until the city did something about it, he said. Caught in a publicity bind, Philadelphia granted the houses to the families, but managed, through the-then city Archbishop John Cardinal Krol, to have Ungerleider sent to Mexico City. To Ungerleider, moments like that are but blessings that fortify his ties to those he serves through the Church. Born in Cambridge, New York, a country town made up of German and other European descendants, Ungerleider had to share the chores with his 11 brothers and sisters. His father was a journalist and his mother a public accountant. Family life was very normal then, he said, gentle and organized –our upbringing was like that of other Germans, everybody had to do something. For example, he said, his oldest brother Jim had to change the diapers of the infants, while he washed the home’s walls and anything that needed washing and others did the cooking, housecleaning, et cetera. The family moved later to Alexandria,VA. David and Jim Ungerleider attended a Jesuit high school over in a black neighborhood in Washington, D.C. and mixed with African American teens. “It was a great experience,” David Ungerleider said. My father thought it was important for us to have a different outlook of the world. Unable to meet his annual tuition of $350, Ungerleider managed to pay it by working as a switchboard operator in the evening hours. His family life then, he said, was as normal as could be.There were no major tragedies, no psychological breakdowns, no gap between parents and children. We were a happy family, he remembers. Young and idealistic, Ungerleider then followed through with his Jesuit studies in Mexico City, and was ordained a priest in 1977. He then moved on to Philadelphia, where his work among the poor included the creation of the Pedro Claver Community Center. Then came his exile to Mexico City, where he got a Master’s degree in social anthropology in 1983. From then on, Ungerleider’s path led him to Puerto Rico, where he worked among the indigent for three years; to Tijuana, where he stayed for almost a year in the early 90s to help pave the street that would lead to the Playas de Tijuana campus of Iberoamericana University; to the Mexican state of Tabasco, where he imparted mass to field workers, and back to Puerto Rico again, where he worked in maximum security prisons for less than a year before heading back to Tijuana, where, apart from his post as assistant to the president of the university, he teaches a class on Mexico’s social realities. His experiences as a student, a teacher, and a priest–all of which, he said, have been invaluable prove to him that a good education can only lead to a righteous path, whether in the lay or religious worlds. “Life is a process of continual learning,” he said. “We must allow young people to go through that process, to see and learn and become the leaders of tomorrow.” Today, Ungerleider is seeing his labor of love–the four projects that will benefit the university and the community at large– nearly completed. Not one to gloat or take credit, Ungerleider is nonetheless happy with the results. But his work is not yet totally done. And money is always an issue. In the case of the chapel, which features the architecture of the Baja missions in San lgnacio, San Javier, and Loreto, some churches in the United States provided funding, including Our Lady Star of the Sea in La Jolla, the Good Shepherd in Alexandria,VA., the HolyTrinity in Washington, D.C. as well as the Rascob <cq, Rascob> Foundation, the Loyola Foundation, the Koch Foundation and the Gavaldn family. Still, Ungerleider must continue gathering funds to see all the projects completed. “Humanly speaking,there is a dose of satisfaction when you seethe buildings take form,” he recently said in a written message to a reporter. “There is also a dose of stress and worry that follows– as soon as I return to the office to figure out how am I going to raise the money to pay the bills. Regarding the near future, he says he is ready to “shift into a lower gear” right now and “not continue at a pace that may put at risk my own physical health — it’s been six years of ‘hard labor’.”He has been able to maintain a balance however by swimming and playing dominoes with his friends, he says. In the meantime, he wants to make sure all the programs “that have been promised and dreamed about begin to consolidate and that goes for the bricks and mortar of the buildings as well as for the relationships they are already engendering. Ultimately, it is hard to know who will get more satisfaction with the results — Ungerleider or the city. But one can guess.